I am crossing the finish line. Still sewing the binding, but the quilt label is done, the sleeve for hanging is complete and all I have left is the last bit of hand stitching to pull it all together. 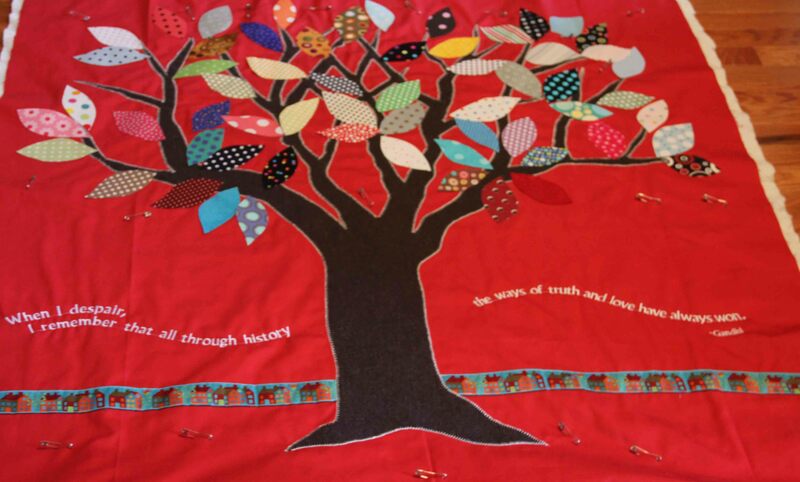 The red background is twill, the tree is wool and the rest is cotton, with a wide variety of thread weights for applique. For everyone who participated in the Polka Dot Fabric Exchange, I THANK YOU! 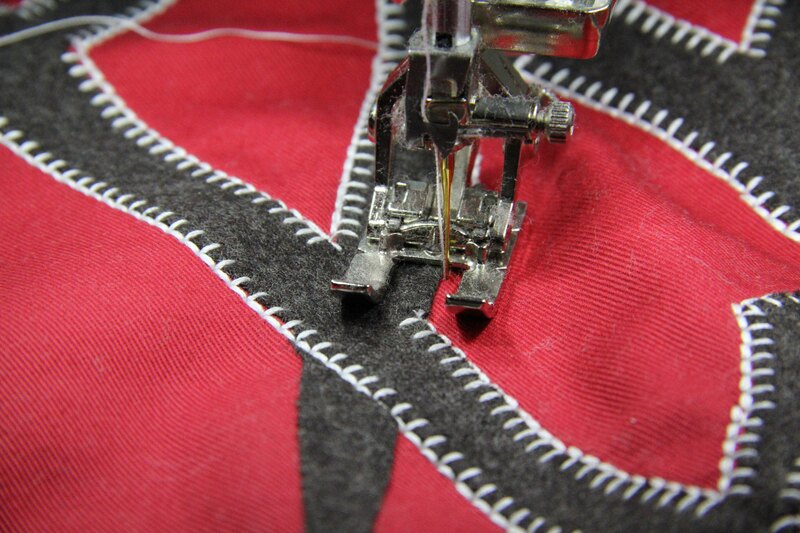 Your fabric is lovely, especially when it’s pieced together with everyone else’s! I really enjoyed challenging myself with this project, as it was a meaningful way of bringing together quilters from around the world. For fun, I thought you might like to see the creative journey, step by step in images. 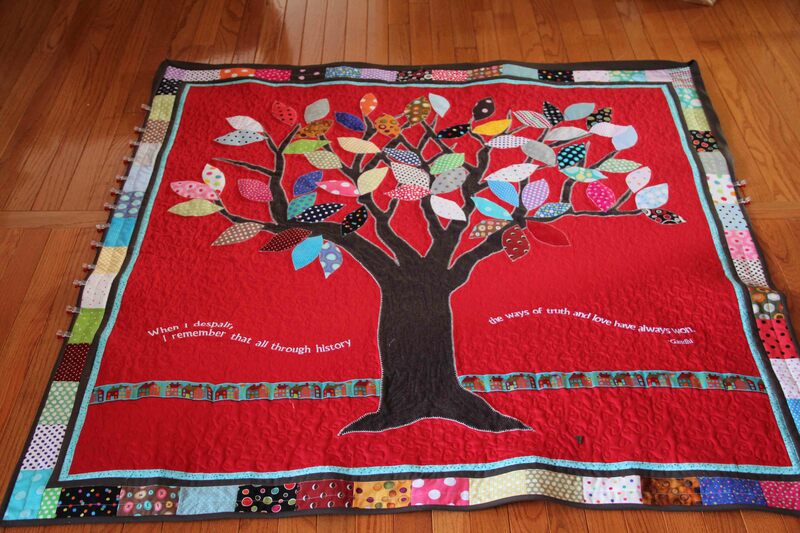 Dedicated to quilters everywhere…we’re all on the same family tree! Scribbling a thought at the breakfast table. The fabric begins to come in from all across the US and the world. I am moved by the notes attached to every fabric square, so I saved them. Getting an idea of how the tree will look. Transferring the drawing of the tree. Cut out and fused down. Leaves have been cut out and placed for position. All appliqued, embroidered, quilted, just about done. Hugs to my polka dot friends! If you have followed this blog for any length of time, you know I participated in a polka dot fabric exchange last year. I received 60 – 10 x 10 in. squares of polka dot fabric from all around the world. 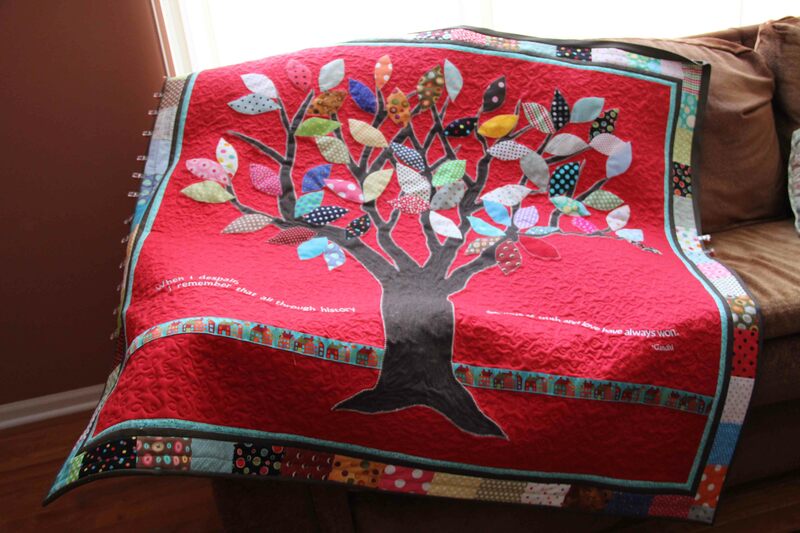 I resolved to include them all in a quilt somehow, and managed to cobble together a tree with the fabric as leaves. But then I had to put the quilt in a “time-out”, as a friend of mine likes to say. Quilts need it, you know. They become unruly, arrogant, resistant. Or sometimes they just become passive or apathetic. Either way, when a quilt reaches that stage of behavior, it’s time to put it in time-out. It makes absolutely no sense to argue or to fight your way through. The quilt needs time to find its way. So I put it in the guest bedroom where it could have some time alone to ponder its future. I checked on it occasionally, offering ideas and solutions, a way out. But the quilt obstinately refused. “OK for you,” I would think. And walk away again, to work on another, more cooperative project. For months it sat, sulking, pouting, depressed even. Then one day, shortly before Christmas, when I walked in to check on it, the quilt looked eager. Just a hint of it, you understand, but there it was: a small little whisper of earnestness. It had formed an idea about its future. And I let the ideas float around for awhile with no pressure or desire for any of them to be successful. Tentatively, we tried something. And then another thing, after that. And now, the polka dot quilt and I are moving forward together, both listening, both asserting, both with renewed vigor. Finally, between all the end-of-summer commotion and back to school and bus rides and new schedules and coordination, I found a few moments to sew. 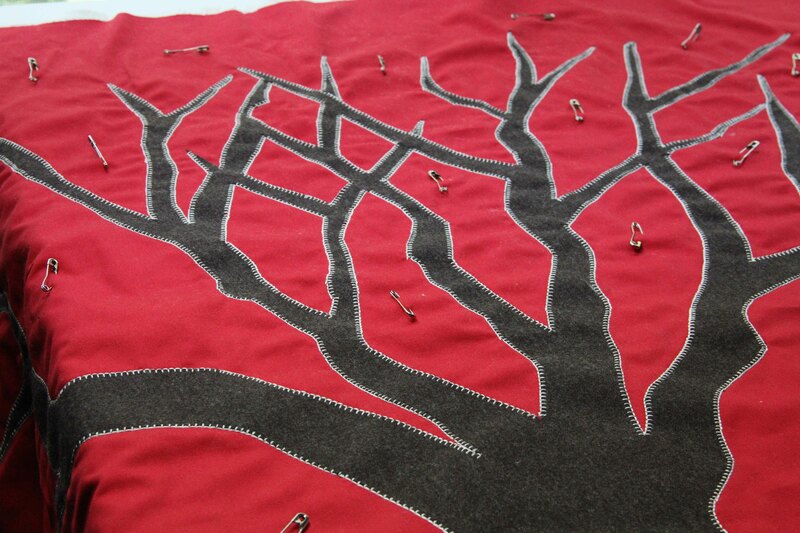 I wanted to get back to the Polka Dot Tree project, which has been sitting on my machine for, I don’t know, months now. 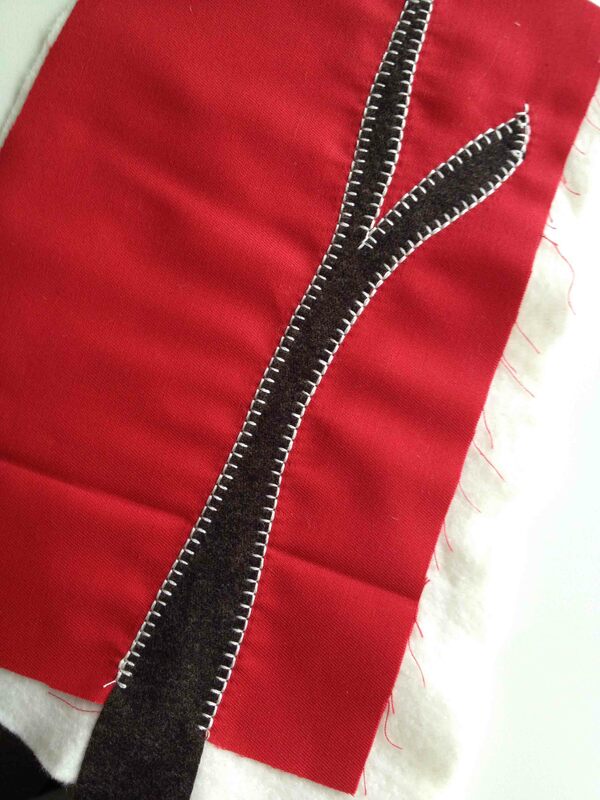 I continued outlining the branches, using the triple blanket stitch. 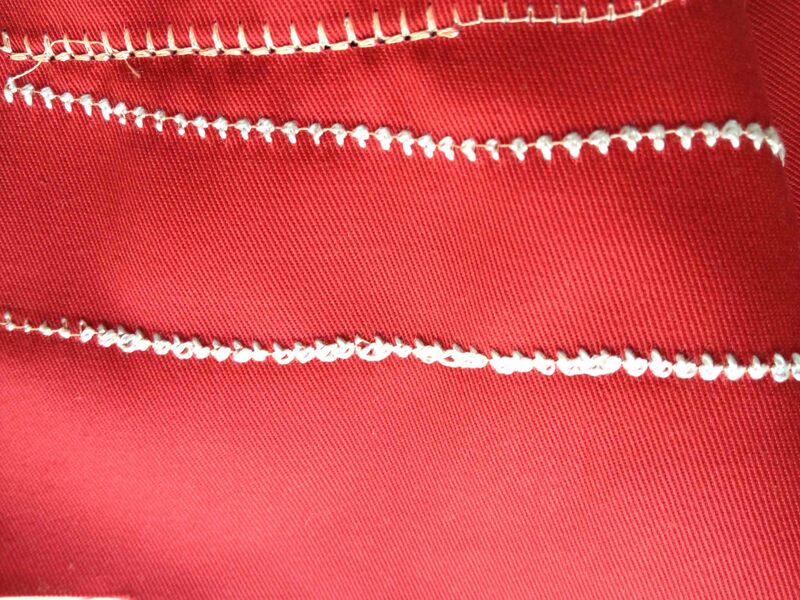 This is such a common stitch but is a little trickier to use than a simple blanket stitch. 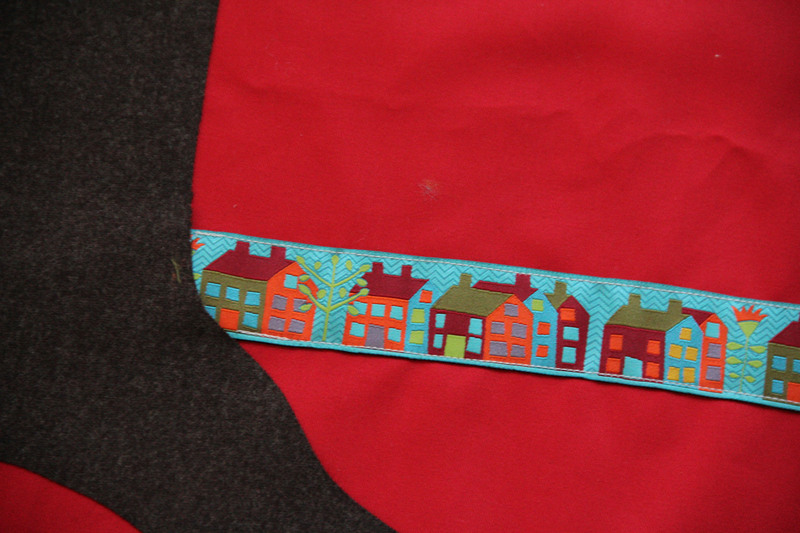 However, for my purposes, it stands out on the tree and branches so much better and has the look of hand stitching. Throughout the project, I had the dual feed engaged and used a number 20 foot so that I could see exactly where I was going. With the branches done, it looks a little more like a Halloween project than I was hoping. However, after positioning some of the leaves, I got a better feel for the direction this project is headed. I guess that’s the beauty of designing and creating my own projects. I have no idea how something is going to turn out til after it’s done. With the polka dot leaves laid out, I am liking the patchwork/scrappy thing that’s happening. I am planning (at least at this point) to do some hand embroidery and hand stitching on the leaves, adding in some wools for dimension. You can just get a hint of some of the fabulous wools in the upper left-hand corner of the shot. I won’t be able to start quilting til after all of that is complete. Since the fabric on this quilt came from 60 different people around the world in a polka dot fabric exchange, the idea of being united is important to me. I am toying with the concept of adding a machine embroidery quote along the bottom. We’ll see. Ideas are easy. Implementation takes a little time. 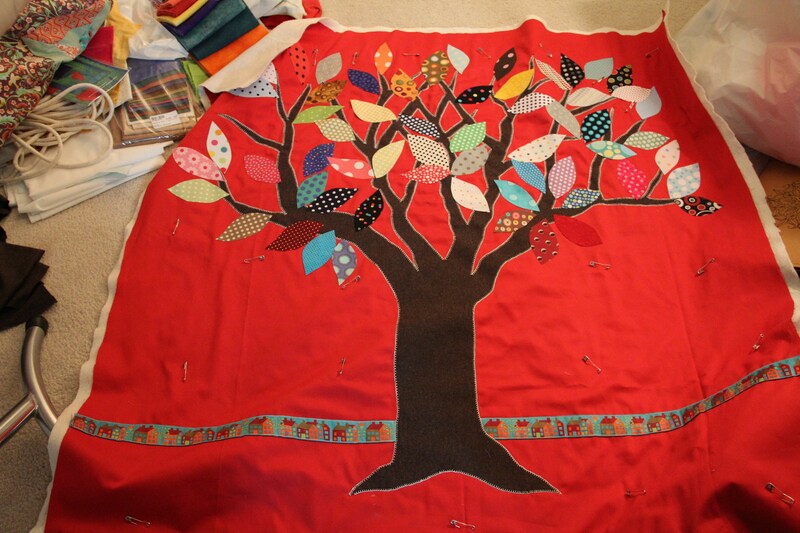 I am making some progress on the Polka Dot tree. Getting the basics right is always slow going…and the truth is, I am making this up as I go along so we’ll see how it turns out. 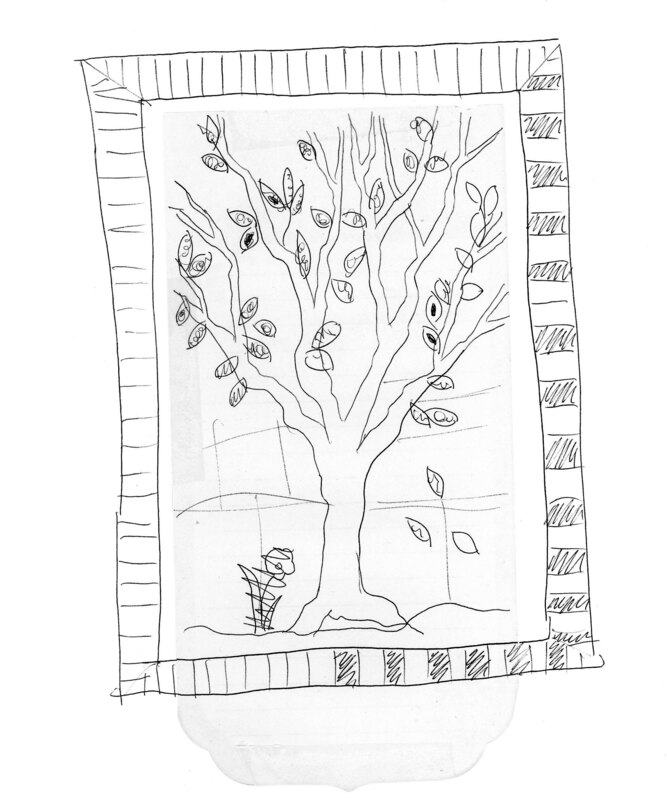 The shape of the tree was first drawn on freezer paper. As you can see, I had to tape several rows of freezer paper together. Freezer paper is cheap. Large format drawing paper is not. I can work with almost anything. Next I took the garment wool, which was half-price at the local shop, and I attached Wonder Under 805 to the back. Any double sided adhesive paper would work, especially Steam-a-Seam Lite. 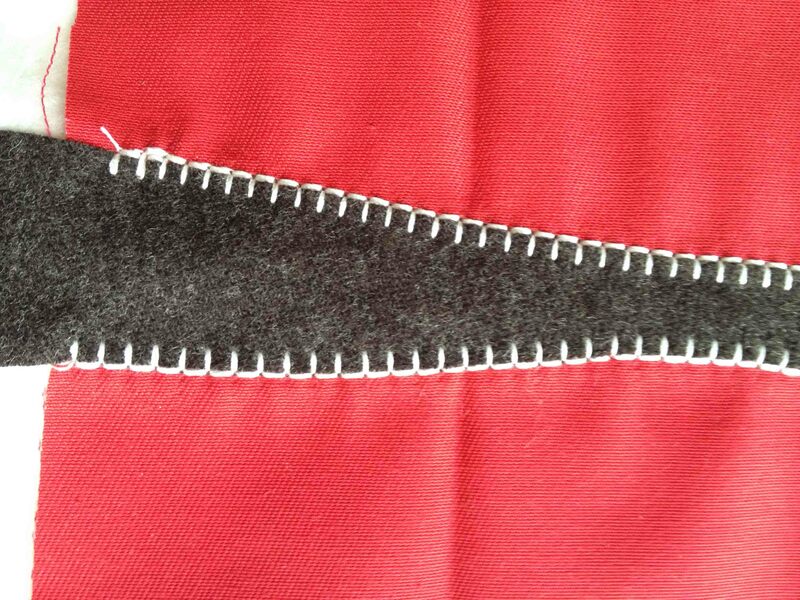 However, my experience is that once I attach the wool and iron it into position, the Wonder Under causes fewer problems with the sewing needle getting loaded with glue gunk. Every project is slightly different so we’ll see how this goes. Next, I laid out the wool with the fusible on the back right side up over my cutting mat, and placed the freezer paper drawing on top. Then I simply trace the drawing with a rotary cutter. 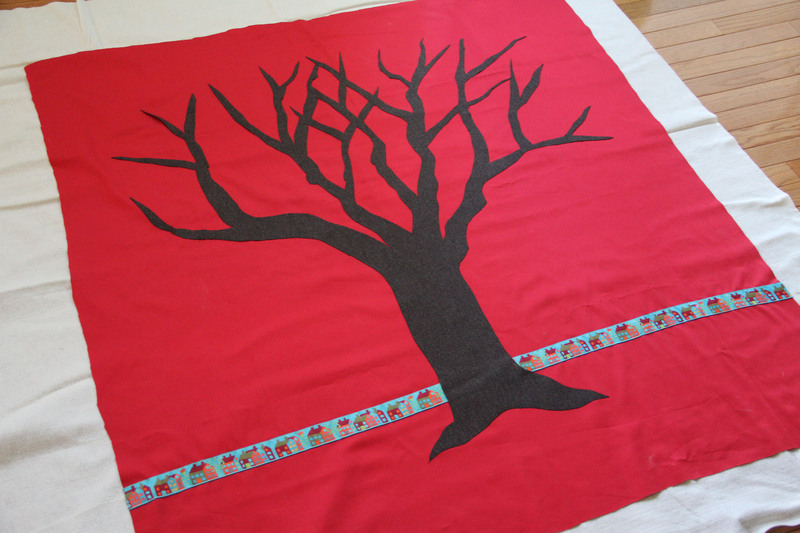 Next comes the tricky part, as the tree then is just a squiggly bunch of fabric that has to be switched over and laid out on the red twill. 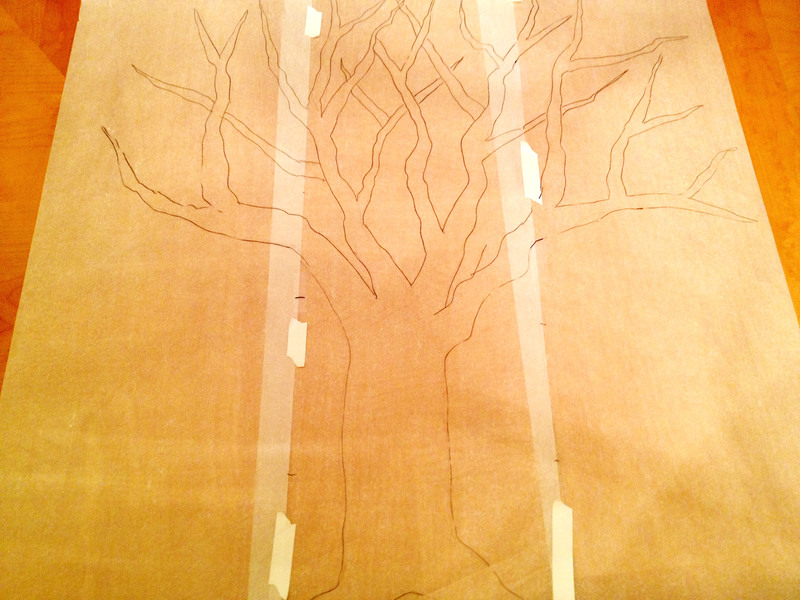 Once it is moved into position, then I carefully remove the backing which allows me to fuse the tree to the background. This is where you have to get creative. I happen to own a small flat ironing pad which I literally move around under the flat tree, and iron/fuse a little at a time until the tree is attached to the twill. It doesn’t have to be perfectly fused, as I will be stitching down all the branches and the trunk. The fusing just has to be enough to hold everything in place while I am moving it around under the machine to stitch it on. Next I spread it out over a layer of quilt batting to act as stabilizer. This is NOT the quilt sandwich! I will eventually trim off the edge of the quilt batting and attach more fabric to the sides of the quilt (I think…if all goes as planned). 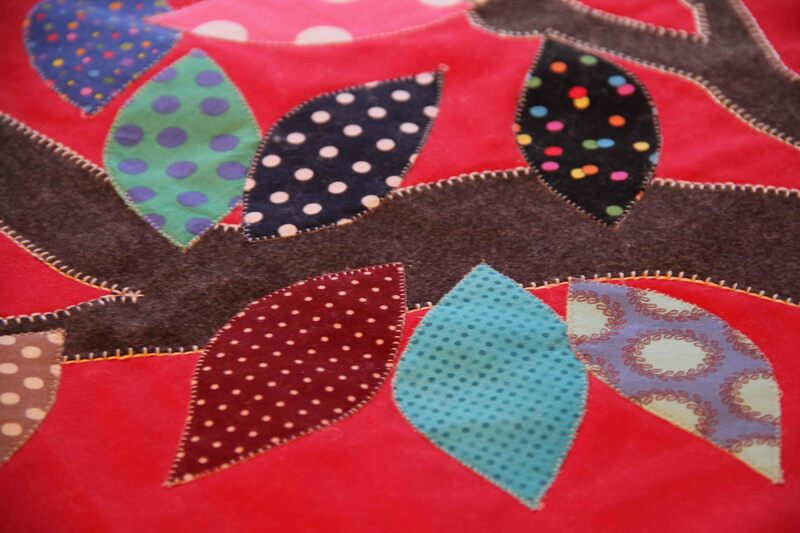 But I will be fusing polka dot leaves on top of all the branches – 60 of them, one for every fabric I received in the exchange. Then I plan to do some embellishing and then once all is finished on the top of the quilt, I will add ANOTHER layer of quilt batting and the backing and then quilt the whole project. Whew! I’m exhausted just thinking about it. But everything follows one step at a time. Keep putting one foot in front of the other and eventually you make progress. Just like life. Second Half of the Polka Dot Fabric Arrived! Your fabric should either be here or in the previous post! 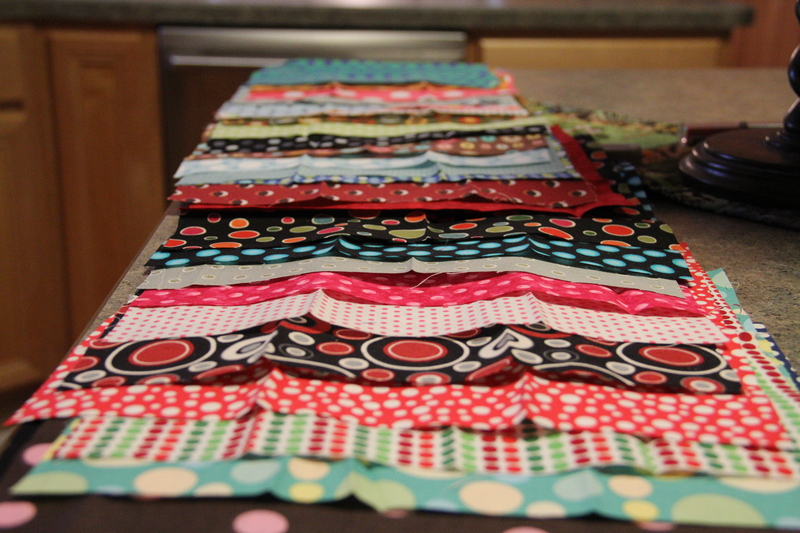 All polka dot exchange fabric has arrived…60 squares! Well, the second half of the fabric has arrived, and I spent the morning pouring over the notes, and fabric and addresses (just to see where everything came from). This whole event has been a fabulous experience…and I haven’t even started to work with the fabric! Vilbert, Germany. Wisconsin. California. Illinois. Derry, Ireland. Canberra, Australia. 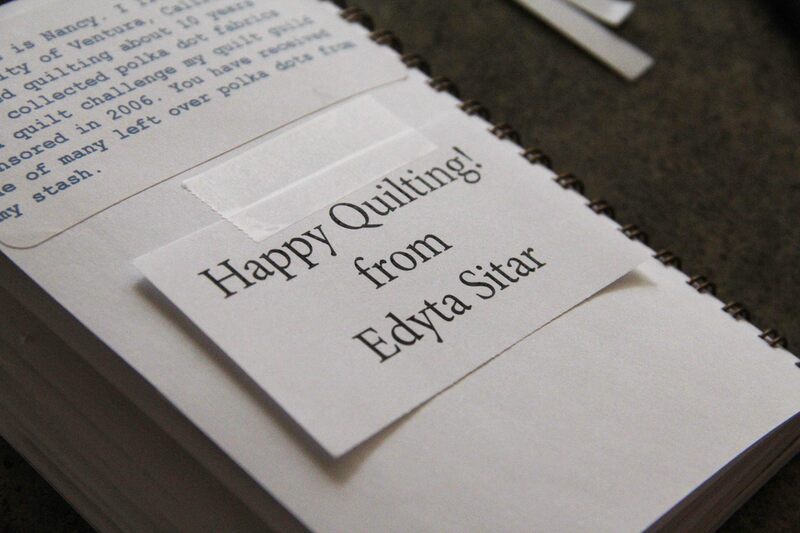 Then, of course, was the fabric square from Edyta Sitar, from Laundry Basket Quilts, who also participated and did a lot of promoting of the exchange on her blog. At this point, I have an idea of what I want to create with all of the polka dot fabric, but I need to work out exactly what I’m going to do…I’ll keep you posted. Many thanks to everyone who participated and to Prairie Stitches for coordinating. This has been a terrific experience and I hope we can inspire one another to great things with all of our polka dot creations! Do you see your fabric yet?? OK folks, this is the first time I have ever participated in a fabric exchange. What a hoot! So far, about half of the fabric has come in…I think. It was 60 that we sent out, so I’m guessing that it will be 60 that we receive. Just getting all the fabric is wonderful, but I am so pleasantly surprised and charmed by the lovely notes and greetings sent in each envelope! I love quilters. No doubt about it. 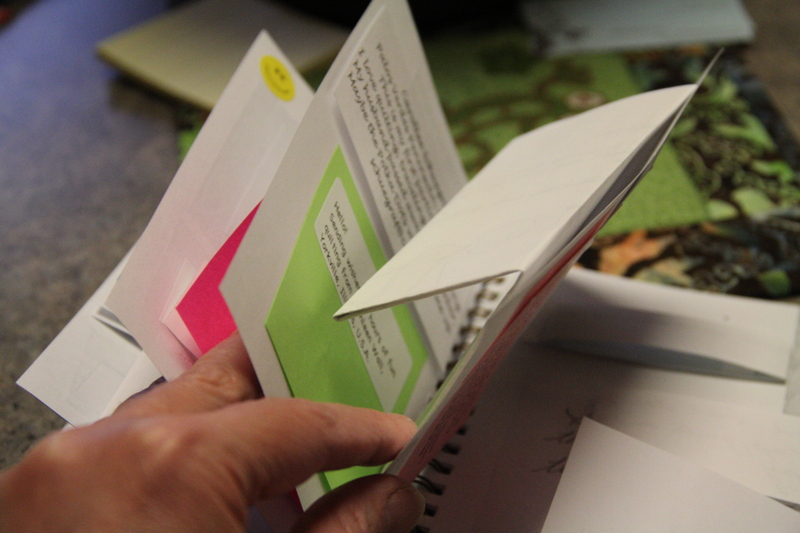 As soon as I opened the first two or three, I decided to create a tiny scrapbook of the notes from everyone, which are just as lovely as can be, don’t you think? If you are receiving them, you know just what I mean–each one unique. Texas. Washington State. Mississippi. Massachusetts. Californinia. Indiana. Virginia. Michigan. New Jersey. Colorado. And that’s just in the first half. I can’t wait to start using all your fabric and I am SO grateful to all of you for participating! If you want to send photos of any of your projects that you work on using the polka dots, feel free to contact me. And I’ll keep up the posting when the rest come in! I’m ready for the World Wide Polka Dot exchange. The fabric has been cut. 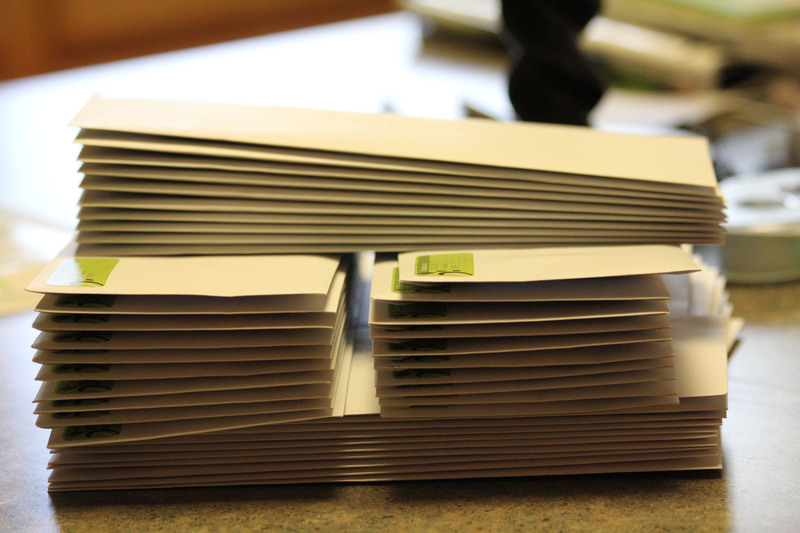 The envelopes are stuffed. Now all I have to do is bring it all over to the quilt shop that’s sponsoring the event — Prairie Stitches Quilt Shoppe in Oswego. Honestly, there’s still time if you want to join! It took me a total of about an hour and a half to 1. cut the fabric, 2. stuff the envelopes, and 3. add my return address labels. I realize, of course, that this whole little event will mean I absolutely must create something with the fabric I receive from others. But that will be a fun little challenge I can take on over the summer. I’m leaning toward a sweet polka dot garden idea. With ricrac. Because what in the world is cuter than polka dots with ricrac? The thing about quilters is that they never seem to run out of interesting ways to connect to one another and to further their hobby/obsession. This year, I am participating in a fun program from Prairie Stitches Quilt Shoppe in Oswego IL. It’s a Worldwide Polka Dot Quilt Fabric Exchange. You still have plenty of time to get involved, you just have to send or bring your quilt fabric to them before March 31. The details of the rules are here in their latest newsletter. The basic premise is this: Cut 60 – 10 in. x 10 in. squares of polka dot fabric. Could be anything with polka dots. You know you have some in your stash or you can purchase it at any quilt store. The only thing they ask is that the fabric be quilt shop quality (no chain store stuff….we all know their fabric is of lesser quality). Put each 10 in. square into a business size envelope with your return address in the upper left corner. Mailing address left blank. Bring all 60 envelopes (or ship them) to Prairie Stitches in Oswego. You have to call and sign up with them as they have a fee which they will use for postage and handling, and they’ll need to register your address. 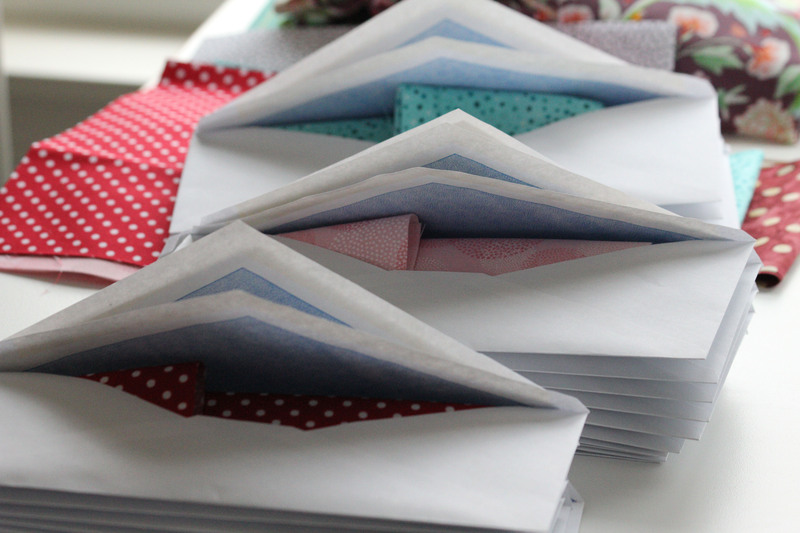 Then just sit back and wait for 60 pieces of polka dot fabric from around the world to be delivered to your mailbox! That’s pretty simple! 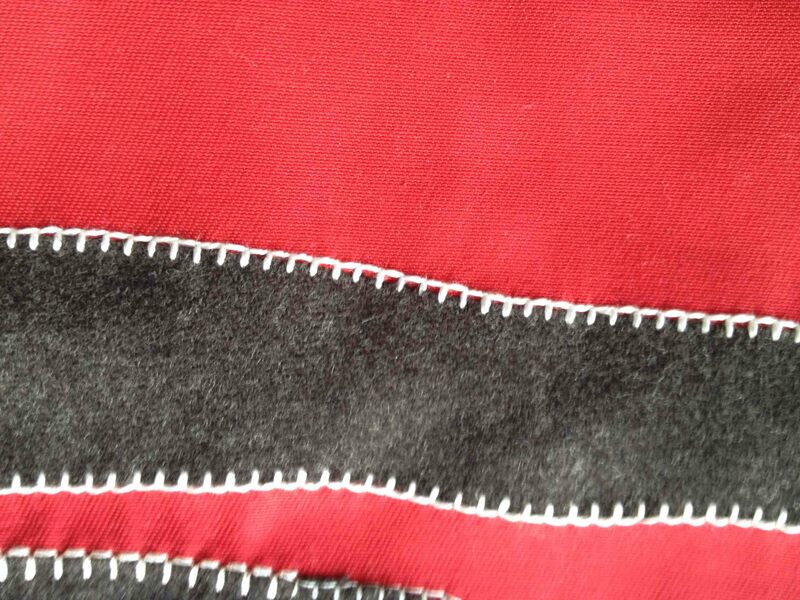 The fabric will start arriving in April. What’s even more fun is they have a couple of Moda designers working on some great pattern ideas for your polka dots when they come in. Prairie Stitches says they have participants now from around the world…Great Britain, New Zealand, Australia and across the US. So tell your friends everywhere to join in. The more the merrier!